One of my favorite color combinations and designer series paper: Groovy Guava, River Rock, and Ginger Blossom. 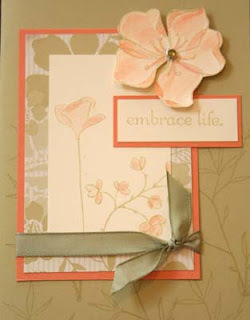 The Embrace Life stampset, like Fabulous Flowers, is coordinated with the Ginger Blossom designer series paper. Stamp card front with stems/vines in River Rock. Stamp the images in River Rock. Stamp greeting on River Rock. Stamp large flower in River Rock on Very Vanilla scrap paper and cut out. Color all images with Blush Blossom and Groovy Guava using Blender Pens. Pierce large flower (handheld punch) and insert rhinestone brad. Assemble the rest of the card pieces.